1 CORINTHIANS 13:13 KJV "And now abideth faith, hope, charity, these three; but the greatest of these [is] charity." 10But when that which is perfect is come, then that which is in part shall be done away. 11When I was a child, I spake as a child, I understood as a child, I thought as a child: but when I became a man, I put away childish things. 12For now we see through a glass, darkly; but then face to face: now I know in part; but then shall I know even as also I am known. 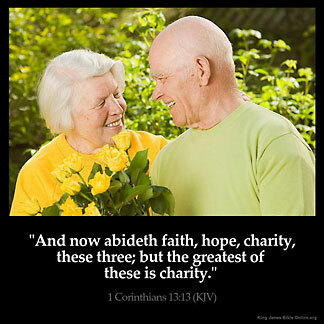 13And now abideth faith, hope, charity, these three; but the greatest of these is charity. And now abideth faith, hope, charitie, these three, but the greatest of these is charitie. And so there remain Faith, Hope, Love--these three; and of these the greatest is Love. And now dwellen feith, hope, and charite, these thre; but the most of these is charite. and now there doth remain faith, hope, love -- these three; and the greatest of these [is] love. 1Co 13:13 But now abideth faith, hope, charity. These three shall survive. They are eternal. They continue to exist in the church, and shall not fail in its glorified state. As long as the redeemed saint shall have future ages before him, so long will trust in God and hope give them brightness, while love itself is the very atmosphere of the divine life. The greatest of these is charity. Love is the greatest because it glorifies both faith and hope, sanctifies every faculty and Christian grace, is the very moving impulse of the gospel, and is the one quality that is divine. "God is love" (1Jo 4:8). In the Vines Greek Bible dictionary : Tells you to go to love : Love : Charity is love of a perfect Being : God : being expressed totally toward to entirely unworthy objects , me , a desire to help others seek the Giver of love : God : Love Charity seeks the welfare of all. I must back up what I believe by the word of God : Else it will fall to the ground and have none effect. Charity means love that is why it is the greatest one out of all three. 1 John 4:7-8 reads Beloved, let us love one another for love is from God and whoever loves has been born of God and know God. Anyone who does not love does not know God because God is love.....So to love is to know God, and to know God is everything. so charity is love. No matter how it 's translated, no matter what biblical, socioeconomic lens one chooses to view that chapter and verse, the foundational understanding that should be considered is how much of the three yea four are displayed in the totality of our lives? Love is God, therefore Love empowers, infuses our Faith, Hope Charity, to individually and corporately exist in the concerns of this world. They are individually wrapped together in the same bonding affect effect of the heart of Jesus Christ. Wouldn 't you agree? Charity is a gift. Love is an aspect of Charity. So what is the greatest?